“Goencho Avaz” the much awaited Konkani musical show organized by Indian Arts & Culture, Kuwait, to be held on Friday, April 26th 2019, at Kuwait Boys Scouts Association Auditorium, Near Ministry of Communication, Hawally – Kuwait. 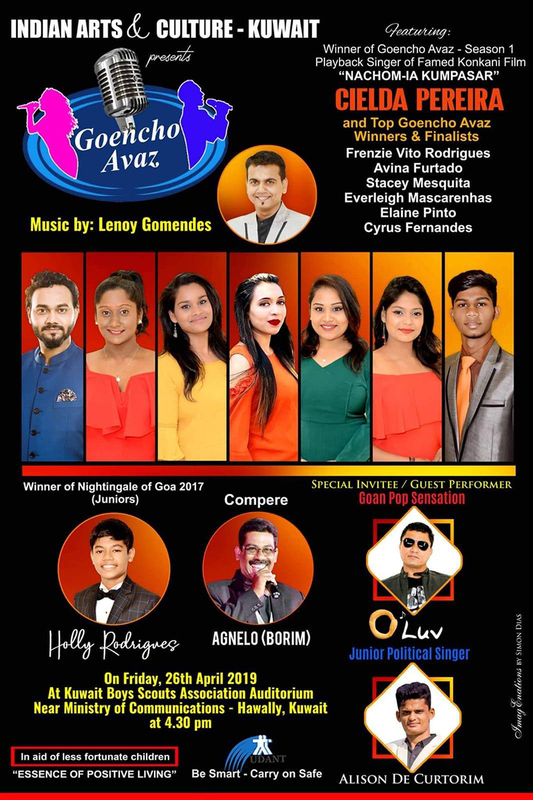 Introducing top singers of “Goencho Avaz” winners & finalist with Season – 1 winner of “Goencho Avaz” and playback singer of famed Konkani film, “NACHOM-IA KUMPASAR” Cielda Pereira, Live in Concert. The gen next stars of Konkani world are all set to entertain Kuwait Konkani lovers. For the first time get set for seven star performances from these budding youngsters, they promised. Frenzie Vito Rodrigues, Cielda Pereira, Avina Furtado, Stacey Mesquita, Everleigh Mascarenhas, Elaine Pinto, Cyrus Fernandes and above all the winner of Nightingale of Goa 2017, Juniors, Holly Rodrigues. The show will be compered by the seasoned and flawless Konkani compere Agnelo (Borim), and music by Lenoy Gomedes. Goan pop sensation O’luv and junior political singer, Alison de Curtorim will grace the occasion as special invites. “Goencho Avaz” is in the aid of less fortunate children, under the theme “Essence of Positive Living” and “Be Smart – Carry on Safe” says a Goa based NGO Udant. Udant is a registered organization working in the fields of HIV/AIDS and related issues with youth in educational institutions and workers in hotels and other industries. Indian Arts & Culture, Kuwait shouldered the responsibilities to enhance the lives of these children with multifaceted needs such as care, education, treatment as well as general support. Come and support this noble cause, your generous contribution will make a huge difference.